One day in 2002, an Ohio genetics researcher looked into a microscope and saw cancer cells dying while healthy cells weren't. This might be huge. Properly mixed, the medicine came out as a dark brown liquid. A nurse brought the intravenous bag to the side of a recliner, where a man with brain cancer sat. The nurse hung the plump bag on a stand and prepared the treatment for delivery. The moment had arrived for BXQ-350 to meet its first human patient. BXQ-350, by Bexion Pharmaceuticals of Covington, Kentucky, is a first-of-its-kind cancer treatment, a new approach discovered, developed and tested in Greater Cincinnati. The innovative drug is made from a human protein and does something unlike any other: It weaponizes the special mechanics of cancer to destroy it, without affecting healthy cells. In the infusion center, the nurse asked Bob Rulli of Fort Thomas if he was ready. She aimed the needle and punctured his arm. Patient No. 1 watched his body take in the dark brown mystery. 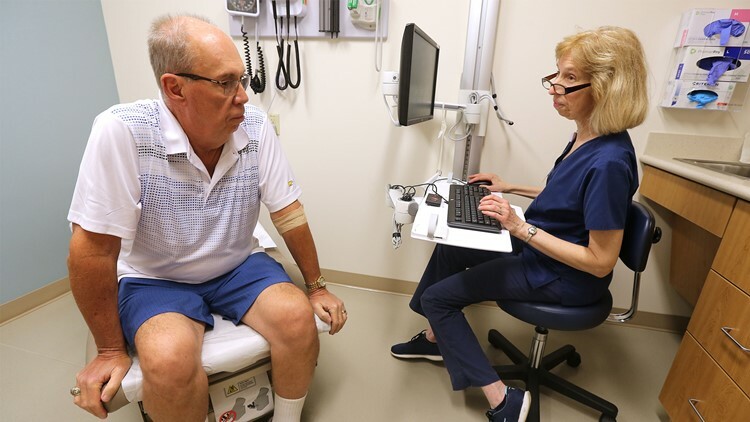 Bob Rulli meets with a nurse at the office of Dr. Richard Curry III for a check-up on his prognosis, Tuesday, July 3, 2018, at Good Samaritan Hospital in Clifton. Along the way, several federal agencies gave Bexion’s work votes of confidence. In 2010, the National Cancer Institute granted $1.5 million for research. In 2013, the NCI bestowed its Bridge Award of $2.9 million. In 2015, the Small Business Administration took note of Bexion's "innovative technologies that address national priorities." 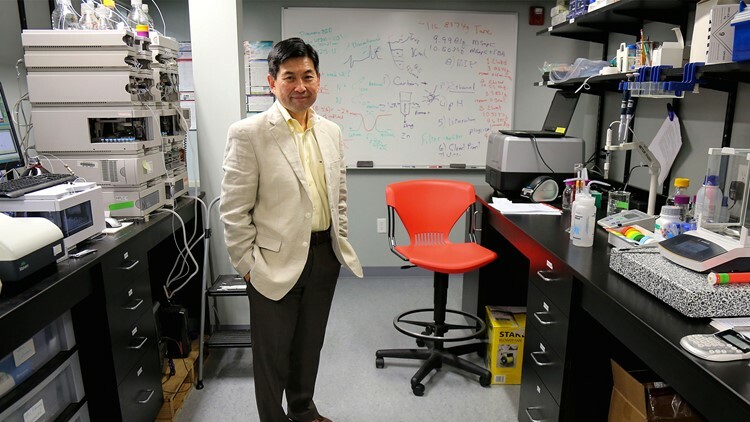 Ray Takigiku, President and CEO of Bexion Pharmaceuticals Inc., stands for a portrait in the company's lab, Thursday, July 5, 2018, Covington, Ky.
On the MRI scans of Bob Rulli's brain, even an untrained eye cannot miss the dark, nearly round void, a little bigger than a golf ball. 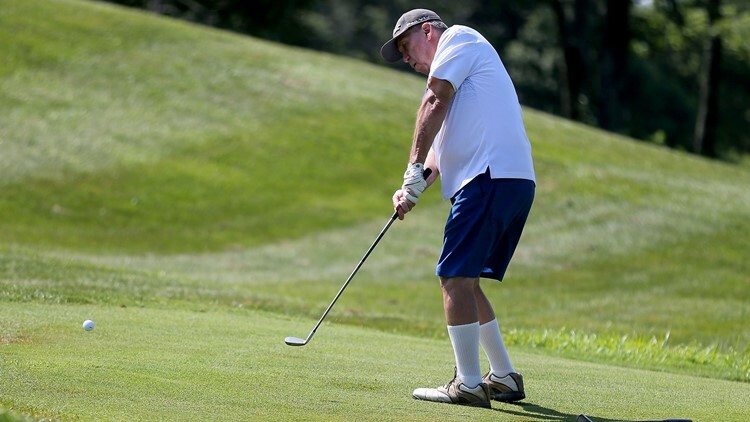 That’s where cancer had grown, in the part of his brain that created thoughts about airplane engines and ways to beat a wicked break on a putting green. In late summer 2016, the tumor surged again. The Rullis consulted Dr. Richard Curry, a TriHealth brain-cancer neurologist. He offered more chemotherapy but not much hope. Bexion, like many small pharmaceutical firms, could not run the Phase I trial on its own. So the company contracted with edical consultancy CTI, founded in Blue Ash, Ohio, which specializes in trials for drugs to treat rare diseases. CTI Chairman Timothy Schroeder told a June 19 breakfast of the Northern Kentucky Chamber of Commerce that his company is so bullish on BXQ-350 that when the time came to shop for a new corporate home, Bexion was a big reason CTI crossed the Ohio River for Covington. Dr. Trisha Wise-Draper works with patients in UC's clinical studies for cancer drugs. She explained to Rulli the mechanics of BXQ-350. The retired GE engineer listened, but not really. It wasn't an airplane. 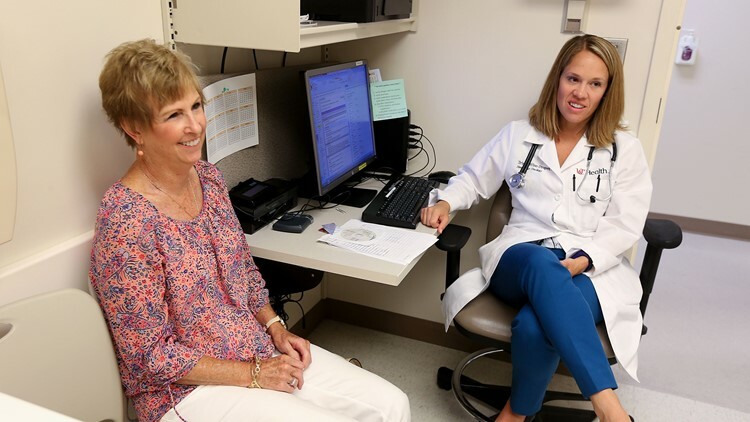 Elise Rulli, left, and Dr. Trisha Wise-Draper, right, the physician running the clinical trial, talk before Bob's transfusion of the experimental drug BXQ-350, Tuesday, July 10, 2018, at the University of Cincinnati's Barrett Cancer Center. Yet the doctors weren't gloomy. Yes, the scan suggested new growth, but the primary tumor was smaller. No one could be sure what was going on until the surgeon went in. The operation, set for May 4, forced the Rullis to cancel the next day’s Derby party. The surgeon, Dr. Bradbury Skidmore of the Mayfield Brain and Spine neurology practice, said that while he is happy for his patient, in the world of brain cancer, Rulli "is an outlier. He is not the norm. As a scientist, when you see one out of the norm, you know that doesn't solve all the problems." In Bexion's office, full of light, exposed brick and simple furniture, Takigiku stopped talking and took a moment. Clinical distance is vital in medicine, but Patient No. 1 is no lab rat. Bob Rulli strikes a golf ball, Wednesday, July 11, 2018, at Lassing Pointe Golf Course in Union, Ky. In the hospital gown, Rulli lay still in the MRI for an hour. Then Curry, the neurologist, examined the scan and cleared Rulli to resume BXQ-350.